Patra's Other Place: Happy Birthday Australia! Happy Christmas to all who read this blog. Gingerbread House and other photos. Some people say that this country shouldn't celebrate the 'birth' of Australia on 26th January, as the Aboriginal people were here thousands of years before then. That is perfectly correct, but those people didn't call the land Australia, and chances are they didn't even know how big their land was, or where it starts and ends. As far as today's population is concerned, when the English people who came here and claimed it for themselves, and eventually named it Australia, that is when our history began. The Aborigines have their own history, and while they obviously weren't happy about the changes that came about over 200 years ago, that's life. It's happened in all countries since mankind starting roaming around the earth, and it's a case of survival of the fittest, just like the animal world. Anyway, our own celebration has been going on for twenty years, and today we continued this little tradition with 7 of our oldest and closest friends for lunch and laughs. The girls bring the food and the guys bring the grog drink, and Ken and I provide the place, as well as extra food and drink. 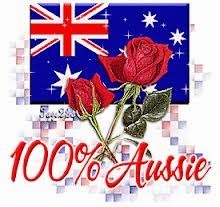 One of the things that many people do for fun on Australia Day is have a trivia quiz with their friends. These are printed in national papers each year, but I make up my own, finding questions and answers in various books and on the internet. 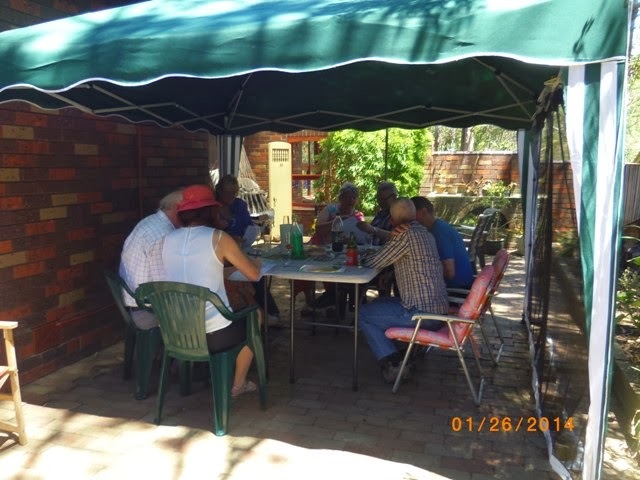 Here are our friends puzzling over the quiz today, in the shade of our gazebo which we set up every year for this occasion, and usually leave it up for the remainder of summer, as it is a lovely spot to sit on a warm day when you want to enjoy the summer, but don't want to get sunburnt! After all that mental effort, I rewarded them with dessert - two pavlovas, cheesecake and fresh fruit salad. 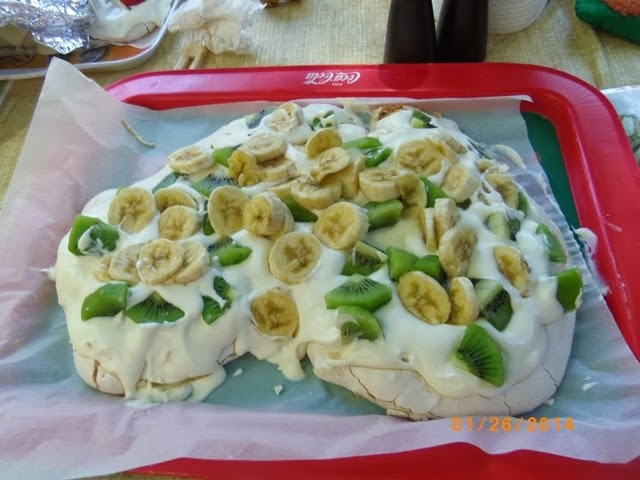 I saw this Aussie Map pavlova in an advertisement last year, and kept the recipe to try this year. It was a bit time consuming, mixing the pav. mix and spreading it on to baking paper in the shape of Australia, but it worked. But then when I put the cream on top, it ran over the edges and poor Australia lost some of it's coastline, lol!